ABOVE: Het Muziekgebouw, Amsterdam's newest concert hall, opened in 2005. Plan your outings and entertainment with a "curated listing of special events, museums, exhibitions, sport, football, festivals, concerts, markets in Amsterdam" from Amsterdamtips.com. Read descriptions of festivals and other special events throughout the year. Dance and theatre performances, unusual films, a video festival, world music, and special events are scheduled throughout the year at this former dairy, which has grown into a major arts center over the past 30 years. 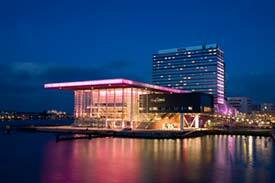 Check the English-language program of Amsterdam's world-renowned symphony orchestra. Amsterdam's opera company is headquartered in Het Muziektheater, which also houses the National Ballet. Amsterdam's "Concert Hall of the 21st Century" has a subscription concert series, festivals, and other performances, with an emphasis on contemporary and chamber music. Check each venue's performance schedule, use the maps to find locations, and read comments by other users. The Old Church is Amsterdam's oldest, and today it's a center for organ concerts and cultural activities in the town center. See the church's Web site for opening times and a concert schedule. Top photo: Erik de Graaf. 1st inset photo: John Sigler. 2nd inset photo: Casper Voogt.